‘The Art Piano’ or the piano as a work of art. An article about special keyboard instruments on which you not only can play beautiful music, but which are above all a feast for the eyes. 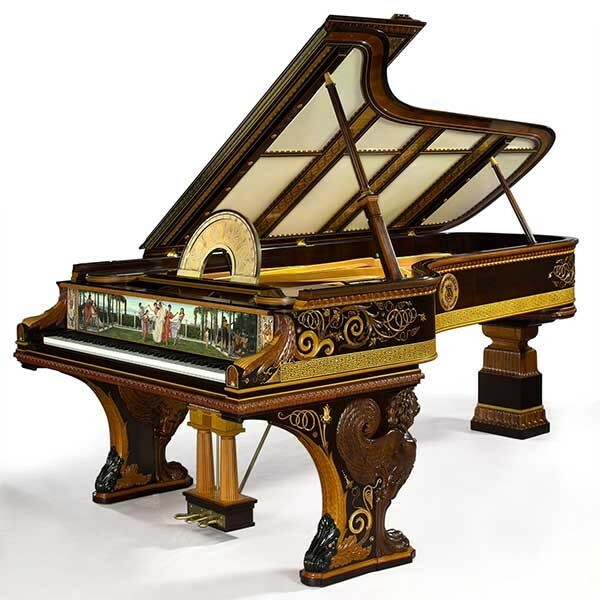 From an ancient pyramid grand piano by Friederici from 1745, via romantic showpieces such as the Bösendorfer from 1867, which was specially built for the World Exhibition in Paris, to the so-called ‘Rhapsody’ from 1998, a blue Steinway of which only 24 have been built, because Gershwin was 24 years old when he composed his Rhapsody in Blue …. Study trip to Brescia, Verona, Padua and Venice in connection with an article to be published in the Journal of the Franz Liszt Circle: ‘Franz Liszt in Venice in the spring of 1838’. Then to Brindisi and from there by boat to Athens to meet the Greek pianist Theodore Tzovanakis, who performed the world premiere of my Eleven Studies on a Theme by J. Mulders on 7 October in Geneva. – and finally, on Sunday afternoon, October 14, in the Amsterdam Pianola Museum. For comments and a fragment of an audio recording, see SHEET MUSIC> Compositions. As part of the festival ‘CHOPIN AAN ZEE’, in which the Franz Liszt Kring participated, I gave a lecture with PowerPoint presentation entitled Ary Scheffer and his paintings of Chopin and Liszt. The direct reason for integrating this lecture into the Chopin festival was the fact that Scheffer was on holiday in Scheveningen in the summer of 1854 and was then visited by Franz Liszt. Because Ary Scheffer made several portraits of Frédéric Chopin and Franz Liszt, and this Chopin festival formed part of the festivities around ‘Scheveningen 200 years a seaside resort’, there was more than one reason to integrate a lecture on the painter’s relations with these two celebrities of Romantic keyboard music. The festival took place in Museum Panorama Mesdag, Zeestraat 65, The Hague. Starting at 18:00 hours. 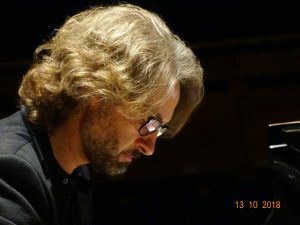 Lecture-recital on the modal-impressionist keyboard music of The Hague composer Bernhard van den Sigtenhorst Meyer in the Stadsgehoorzaal Vlaardingen, Schiedamseweg 51, 3134 BB Vlaardingen. Approximately twenty compositions will be performed, all explained and illustrated with poems and images. Starting at 3 pm; entry € 20, -, including a snack and a drink. Reservations are possible via the website of the Stadsgehoorzaal Vlaardingen.